After we sold a newly crafted leather settee to Susan R. in Rocky River, OH, I was delighted when she sent a photo of the sofa in her home. The antique saddle leather settee is one of the most popular pieces in our large selection of new leather settees and sofas, and it always looks wonderful whenever we see client photos of it. It blends with many different styles of decor and its graceful lines bring a lovely sense of elegance into any room. Here’s the antique saddle leather settee. With its handsome looks and high-quality craftsmanship. It’s perfect for an entryway or as seating in your dining room or living room. The settee is sturdily crafted with a solid birch wood frame finished with a rich dark walnut stain that is applied by hand. The settee is upholstered with antiqued saddle brown split grain leather which works beautifully with the walnut finish. A hand-applied nailhead trim highlights the refined lines. Here is the settee in Susan’s home. Susan asked me to hold shipping as she was about to take off on a European adventure for two months. I was happy to oblige and made sure the settee arrived just after the world-traveler returned home. I love the artwork surrounding the settee – what a cozy spot to read a few letters or chat on the phone! 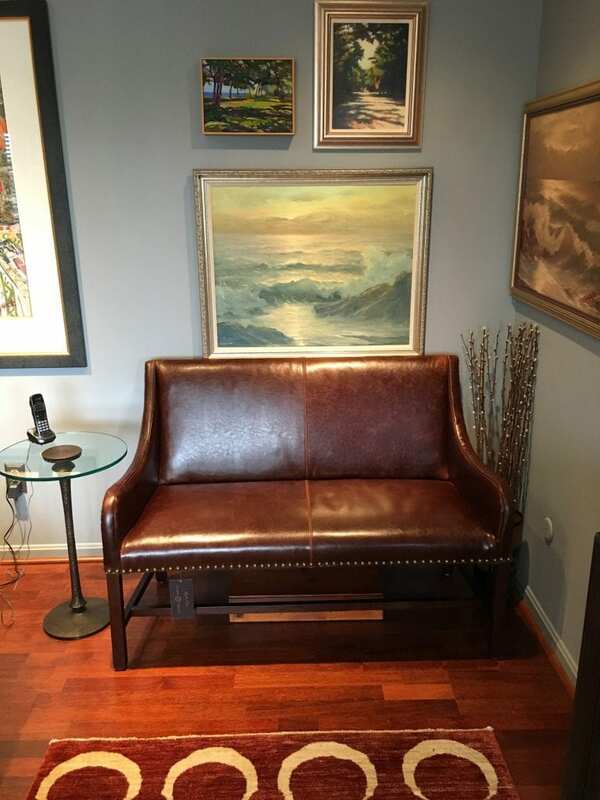 Thank you for sending the photo of the leather settee, Susan. We hope it gives you many years of comfort! 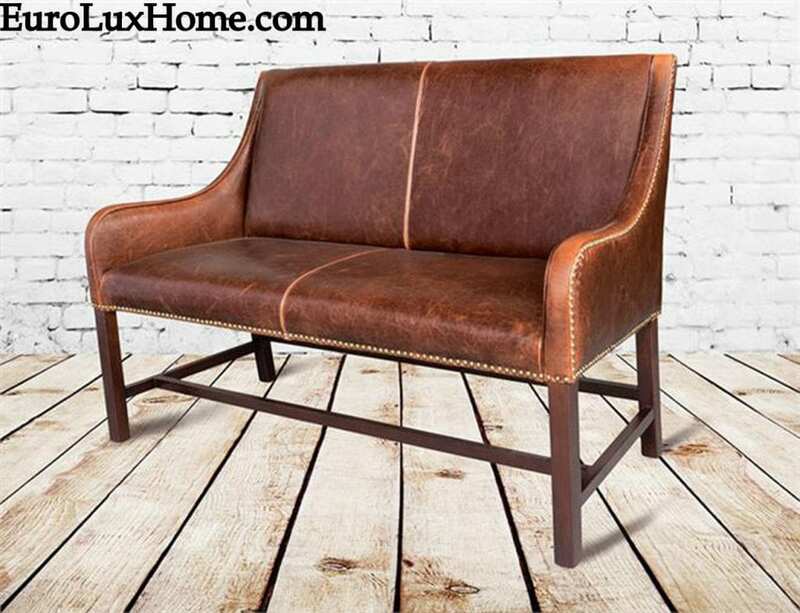 This entry was posted in Client Spotlight and tagged antique inspired furniture, high quality reproduction furniture, Leather furniture, sofas and settees, traditional home on January 29, 2019 by admin. Now through February 4, we’re offering a 15% discount on everything at EuroLuxHome.com with our special promo code to celebrate Bubble Wrap Appreciation Day! January 28 is Bubble Wrap Appreciation Day. As you can imagine, we use a LOT of bubble wrap in packaging antiques for delivery around the country. 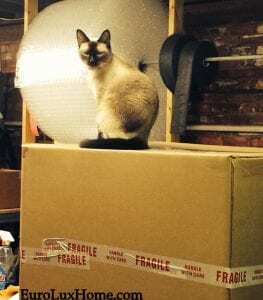 Our dogs and cats love it too… here’s Minkey (our shipping manager!) taking charge of our enormous roll of bubble wrap! It’s the perfect time to find a unique antique treasure that you love! Or think ahead to summer wedding gifts and other gifts for family and friends this year. The discount is valid on everything in our gallery, including fine European antiques, vintage decor and high-quality new furniture and lighting, As always, shipping is free in the Continental US and some parts of Canada. We’ve just had a new container of antique furniture arrive from France, filled with goodies that we selected on our last European antiques buying trip. You could use your discount on any of these wonderful pieces, including…. This antique Renaissance Henry II style buffet features stunning carvings evoking the seasons of the year. The cheerful face of Zephyr, the Greek god of the west wind breathes out a warm spring breeze at the top of the cabinet. You will almost feel the gentle breeze wafting through the room as you admire the ornate carvings on the walnut buffet, dating to 1900. The large buffet also offers lots of practical storage, in addition to being a work of art that will look amazing in your traditional dining room, kitchen or great room. The carved winged beasts keeping guard over this antique French Hunting style desk look like the famous mythological griffins, with the body of a lion and the head and wings of an eagle. 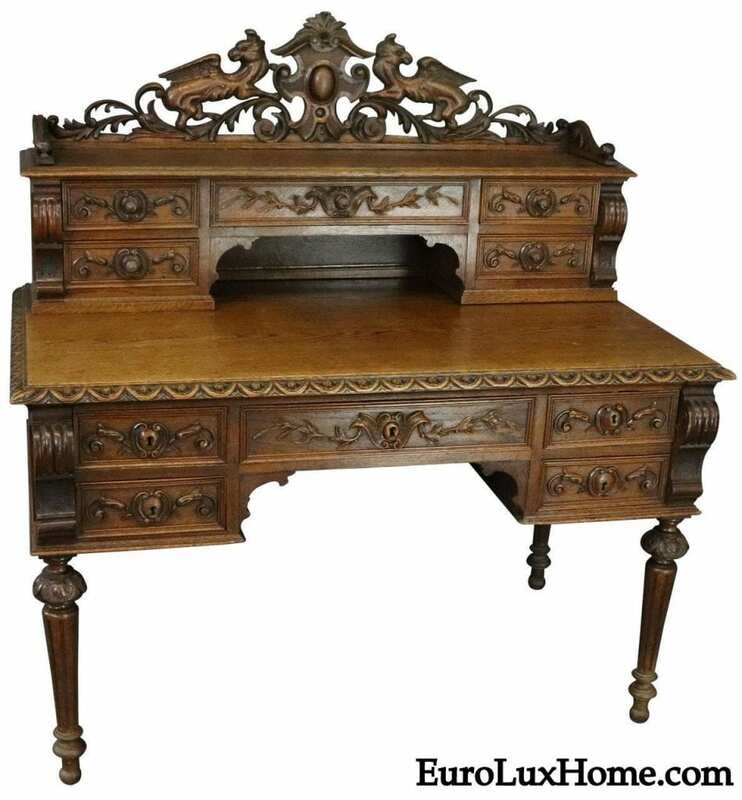 The Hunting style desk was made in France around 1880 in solid oak wood and it will look stunning in your home office or library. 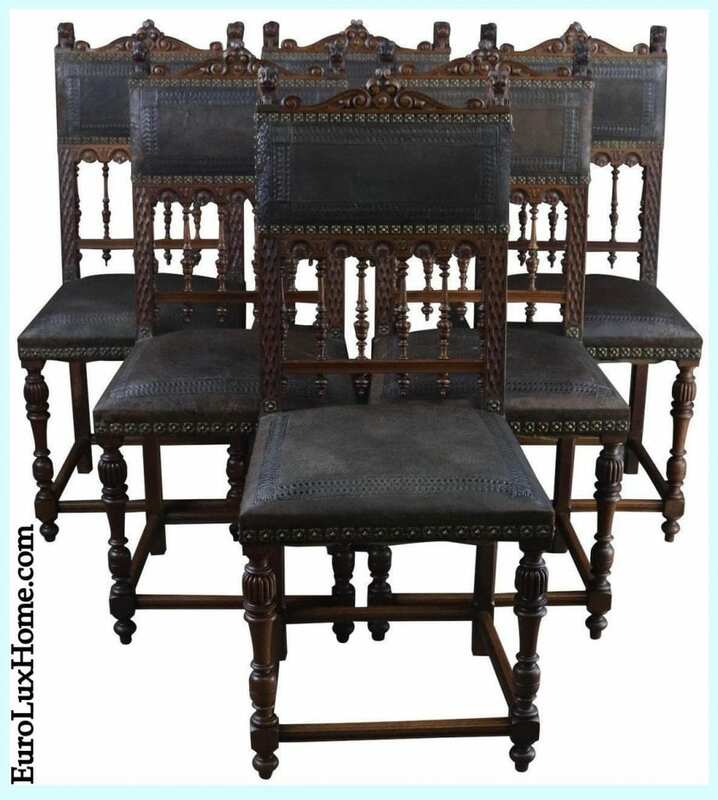 This set of 6 Renaissance Henry II style dining chairs is crafted in walnut wood and upholstered with embossed leather. Dating to 1900, the dining chairs or side chairs have a lovely open and airy profile due to the slightly longer than usual turned spindles along the chair back. The elegant armless dining chairs have a timeless appeal, and they would look beautiful as side chairs in any room of the house. When we found this vintage 1950 Rococo style chandelier on our latest antiques buying trip in Europe, we knew someone back in the USA would love it! 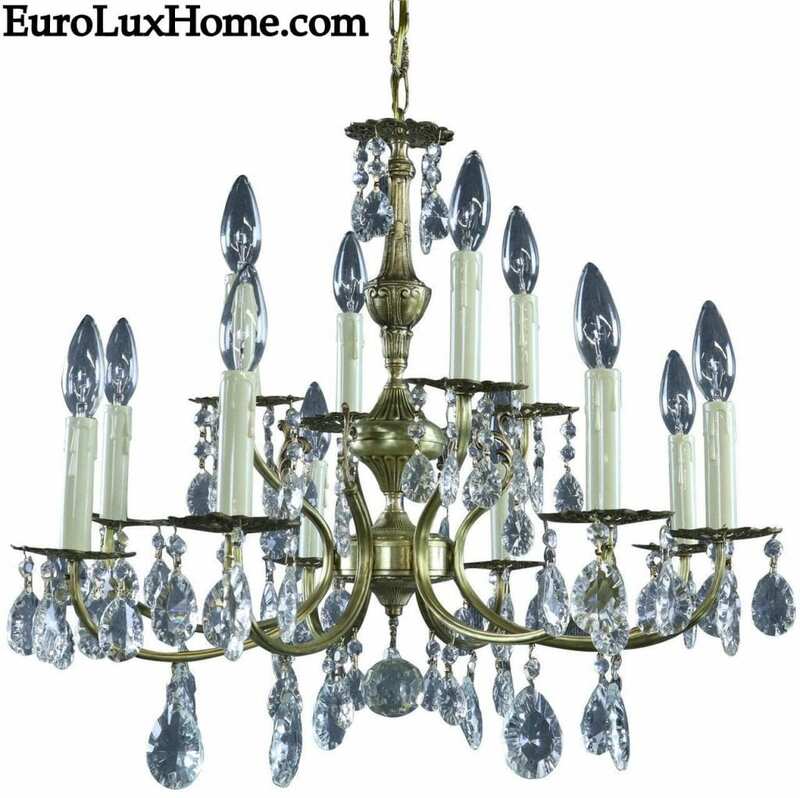 Sparkling gloriously from top to bottom, this incredible vintage French chandelier in the Rococo style boasts 12 electric candles that glimmer with a beautiful light reflected in the glass crystals. 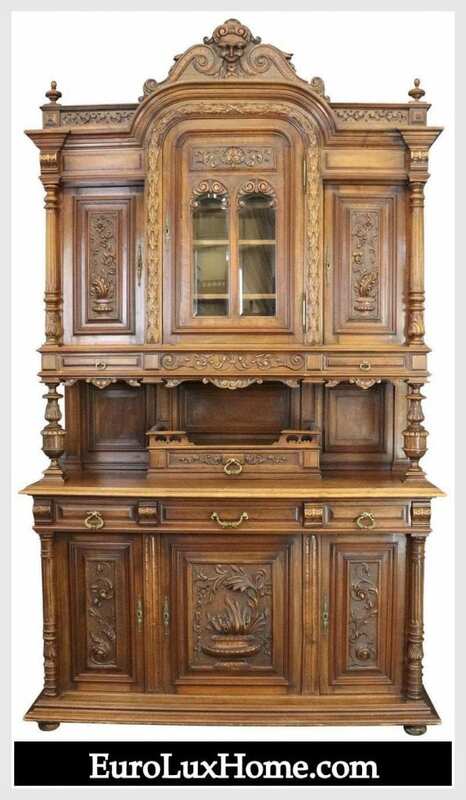 This entry was posted in Antique Furniture and tagged antique buffet, antique desk, antique french buffet, Antique French Renaissance Henry II Style Buffet, Antique Furniture, antiques, Antiques Shopping, chandeliers, coupon code, discount, French Antique Furniture, Hunting Style, King Henry style, Vintage Chandeliers on January 28, 2019 by admin. January is the perfect time to think about the Hygge home! 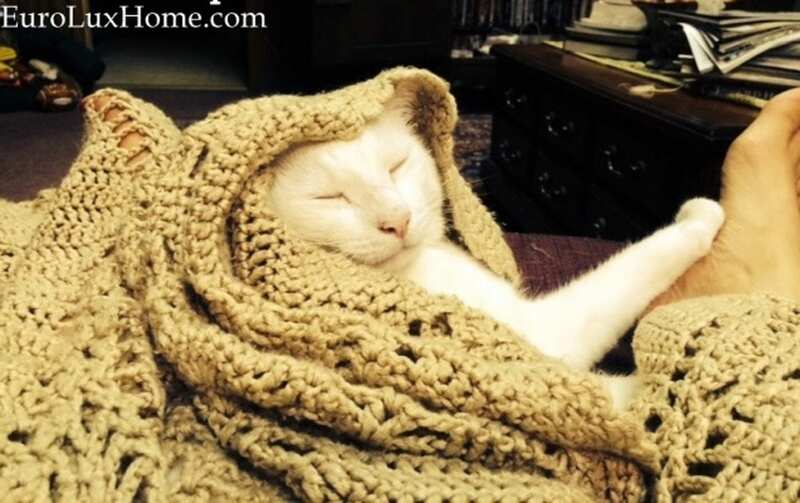 Hygge is a Danish and Norwegian word for a sense of cozy well-being… a mood of peaceful comfort and contentment. In a troubled world, It’s not surprising that Hygge is a big trend. It is so comforting and lets us take a relaxing and replenishing escape from the busy world! Here’s Lenny taking a Hygge moment, just to show the humans how to do it! 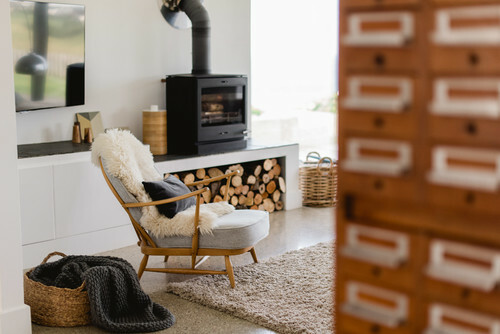 The style is associated with Nordic interior design, but even if you don’t like Nordic style you can add elements of Hygge style into your space. Here are my tips to get a sense of Hygge at home. The word is pronounced hoo-ga – which already makes me smile as it is pretty fun to say! The easiest way to get into the Hygge frame of mind is to think warmth, candlelight, fireplaces, and snuggling up with a delicious hot drink and a deep conversation with a few close friends, or perhaps a quiet evening curled up with a great book! 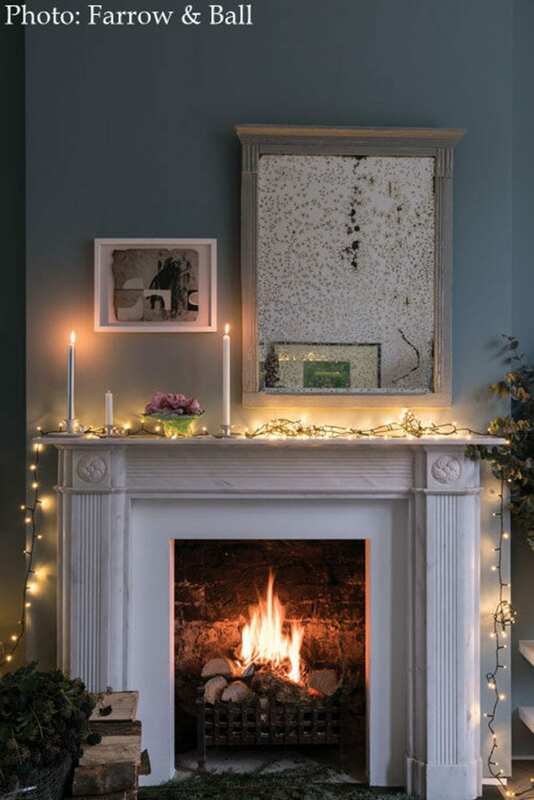 This photo from the Farrow and Ball paint company evokes the feeling perfectly, and their dark blue paint (called Oval Room Blue) adds to the appeal of the roaring fire. The antique-style mirror helps reflect light back into the room even in winter’s dark nights. Another nice way to bring pretty light into the room is to pull out the Christmas string lights and drape them across the mantel, an antique buffet or sideboard, a shelf, or an architectural feature to give a firefly glow. Candles are essential to the Hygge look. Gather all your candlesticks to make an eclectic display, or use votives or tea lights. This Cyan Design Kalliope candle holder from our selection of new and vintage candlesticks is a great choice. 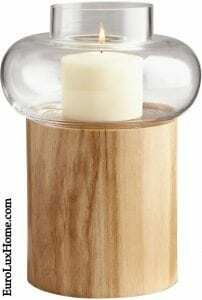 The natural oak and dimpled glass evoke a sense of simple serenity. Also think about soft and cozy textiles, with tons of texture. For example, sheepskin throws, chunky cable knit blankets, cuddly cushions and pillows, and snuggly hand-hooked rugs, like the selection of rugs by Michaelian Home in our online store. Definitely you’ll want to put away your phone and other technology for your few hours of Hygge well-being! Whether you spend some self-care time alone or share a more social gathering with friends, turn off the beeping, buzzing, and constant online notifications! Unplug from the virtual world and make a soul connection with the people around you by sharing memories, discussing your favorite books or movies, or playing good old-fashioned games! Whether your game of choice is Trivial Pursuits, Monopoly, checkers, or chess, games are a great way for young and old alike to bond and share a real connection. Then whip up some homemade cookies or cake, make some delicious hot tea or cocoa or another warming drink, and enjoy every Hygge moment! How do you create the Hygge mood and decor in your home? Tell us about it in the comments! This entry was posted in Home Design Ideas and tagged creative home decorating, home decor accessories, home decorating, home decorating trends, Hygge, interior decor, interior design on January 17, 2019 by admin. In my last blog post I gave you a roundup of the first of our top home decor and antiques blog posts of 2018. Here’s Part 2 with the remaining five of our favorite 10 posts from last year. It’s been fun to recall some of the things we talked about in 2018. I hope you enjoy seeing the highlights too! We were thrilled to see a feature about our customer Tamra’s home in Columbia Living Magazine. 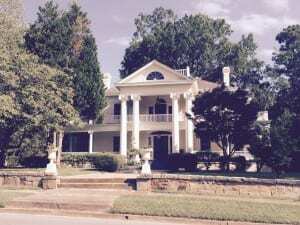 The article mentioned some of the antique furniture Tamra purchased from us and we found out more about Tamra’s house, this beautifully restored Greco-Roman mansion in Newberry, SC. See the full story and more photos of the inside of the house in the blog post Customer’s Newberry Cam Davis Mansion and Antiques in Magazine. 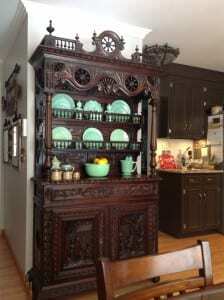 Some of our customers have been very creative in the way they’ve repurposed the antique furniture they bought from us. Lifestyles have changed over a century, so our home decor and storage needs have changed too. But our love for beautifully made and hand-carved furniture doesn’t change! Perhaps a piece was first crafted as an armoire, nightstand or buffet, but there is no reason that you can’t use it for a very different purpose.This Repurposed Antique Furniture blog post shows how our clients have thought creatively to adapt an antique piece to their needs! 3. Meet Our New Dog, Ernie! Last July a scared, lost pup turned up literally on our doorstep. 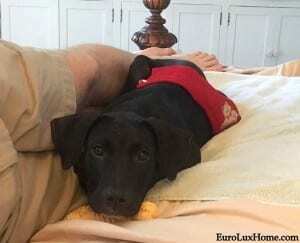 He was terrified and seems to have been severely abused, with a large infected bite wound on his side. A trip to the vet revealed a very high fever of over 103 degrees. We guessed that he may have escaped a life as a bait dog. Well, after a few weeks of TLC, he was all healed up…. and he’d also found himself a new home! While we REALLY didn’t need another pet, how could we resist? See the full story and more photos, including his first introduction to Minkey the cat, in the blog post Meet Our New Dog, Ernie! The Greek Key pattern is one of the most elegant designs in home decor and furniture. The classic angular design is very harmonious and it has remained popular for thousands of years. It works with all styles of interior design schemes too! So in my blog post Greek Key Pattern in Furniture and Decor I tell you a bit about the history of the design and also show lots of ways to incorporate the pattern into your home. From textiles to tiles, from furniture to light fittings, the Greek Key pattern always looks chic and interesting. 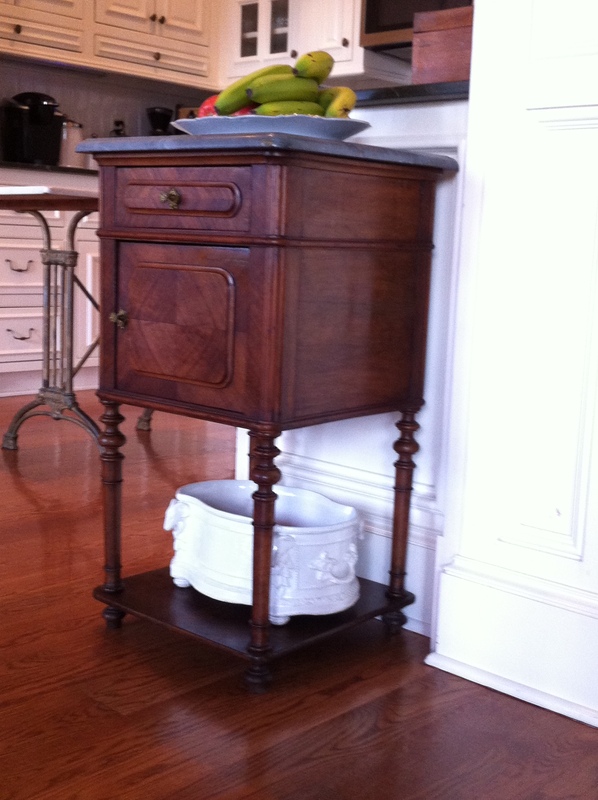 Our customer Debbie found a very beautiful antique Brittany buffet in our gallery that was on the smaller side and so it was the perfect fit for her kitchen. It was also the perfect piece to display Debbie’s Jadeite Fire King collection. The Jadeite dishes were made by Anchor Hocking in the 1940s and Debbie started collecting them a few years ago because she loves the jade green color. It looks fabulous against the dark wood of the buffet! In my blog post Antique French Brittany Buffet with Jadeite Fire King we take a look around Debbie’s lovely home in Charleston, SC. We are looking forward to another year exploring the best in antiques and home decor, and also taking tours of our customers’ homes! We hope that you have a wonderful 2019 too! If you missed Part 1 of our top 10 antiques and home decor blog posts of 2018, you can see the other five at the link. 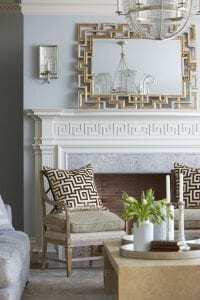 This entry was posted in Antique Furniture, Home Design Ideas and tagged antique French furniture, Antique Furniture, Antiques Blog, creative home decorating, interior decor, interior design, living with antiques on January 11, 2019 by admin.